In 1893, a woman by the name of Margaret Gainer was arrested, charged, and ultimately sentenced to thirty days imprisonment for stealing a bottle of violet perfume from a hairdresser’s shop. The hairdresser had seen her take the bottle and slip it into her pocket, but when he gave her the choice of putting the bottle back or facing the consequences, Miss Gainer steadfastly refused to relinquish the violet perfume. Her motivation for the theft—and her subsequent unwillingness to part with her ill-gotten gains—is not entirely clear; however, I suspect it had more than a little to do with the late Victorian violet fad. Advertisement for Roman Violet Perfume, The Spatula, 1898. Advertisement for Crown Violette Perfume, Musical Record, 1897. 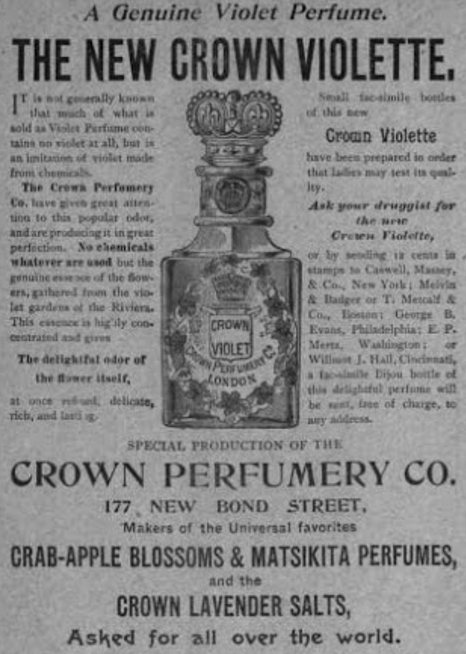 Advertisement for Violet Perfumes, Barnsley Chronicle, 23 July 1898. Does any of this provide us with an explanation for why Margaret Gainer pocketed that bottle of violet perfume and refused to give it back? Perhaps, like the Empress Eugenie, she hoped to ensnare a desirable gent. Or perhaps, she merely wanted to smell like a woman of fashion. Was it worth thirty days in prison? I suspect not. 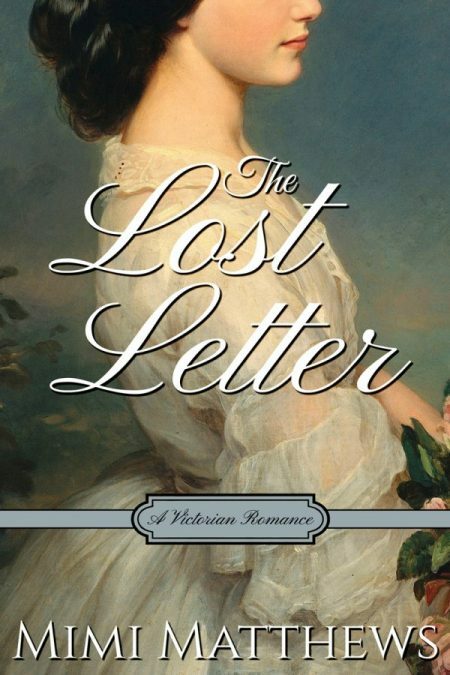 I had to research violet perfume quite a bit when writing my Victorian romance novel, The Lost Letter. It is the preferred fragrance of my heroine, Sylvia Stafford. Now a governess, she can no longer afford violet perfume and, instead, must make do with violet-scented soap. Barnsley Chronicle (South Yorkshire, England), 23 July 1898. © British Library Board. Canterbury Journal, Kentish Times and Farmers’ Gazette (Kent, England), 7 March 1896. © British Library Board. Dundee Evening Telegraph (Angus, Scotland), 16 June 1893. © British Library Board. Illustrated London News (London, England), 1 December 1894. © British Library Board. Kraemer, Henry. 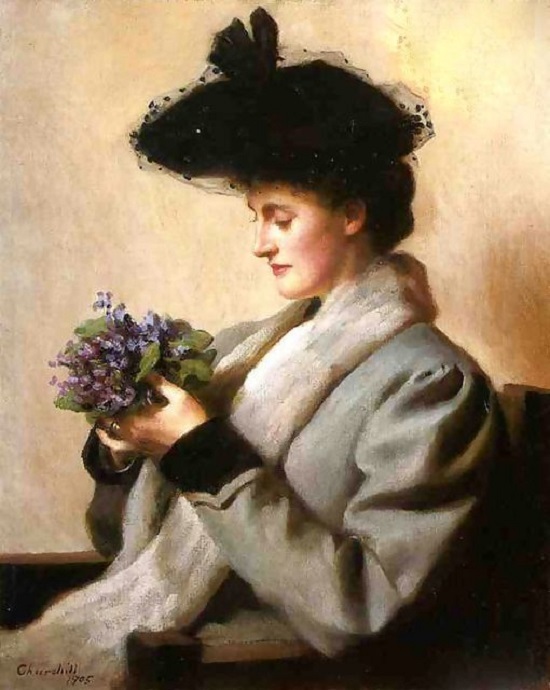 “The Violet Perfume.” American Journal of Pharmacy and the Sciences Supporting Public Health, Vol. 67. Philadelphia: Philadelphia College of Pharmacy and Science, 1895. The Musical Record. Boston: Oliver Ditson Co., 1897. Yippee, I got notification! Fascinating, I wonder why violet scent was so popular? it’s sickly and cloying. Mind, I suppose that adequately describes a lot of Victorian ladies … I’m a lily-of-the-valley person myself. Yay! I’m so glad it works :) As for the popularity of violet, I think you’re right. It can be a bit cloying. I got a few floral perfumes last Christmas just so I could smell them all and get a feel for them for my writing. I hadn’t realized how sweet Violet would be! I’ve never been a fan of floral perfumes myself (I like a little citrus with a little sweet), and off the top of my head (or perhaps I should say off the top of my nose!) I can’t envision the smell of violets. But no matter how nice the scent of any perfume, I can’t imagine it would be worth even a single night in jail! I agree, Wendy :) No perfume is worth going to jail for! Aw thanks, Paper Doll :) And you’re right about subtlety in perfume. The Nineteenth Century world was a lot smellier than ours is now!